In addition to profitability, there are significant “soft benefits” to eco-friendly business practices. Corporations that practice sustainability see higher levels of worker engagement, better PR, more engagement from their customers, and more opportunity in the global market. (1) These benefits may be less measurable than bottom line profit, but they are equally powerful in driving revenue growth. Growth leaders have already begun capitalizing on these opportunities, and sustainability is becoming the “new model” for being successful at scale. It is important to remember that the vast majority of Americans, and an even greater percentage of global consumers, feel strongly about sustainability. 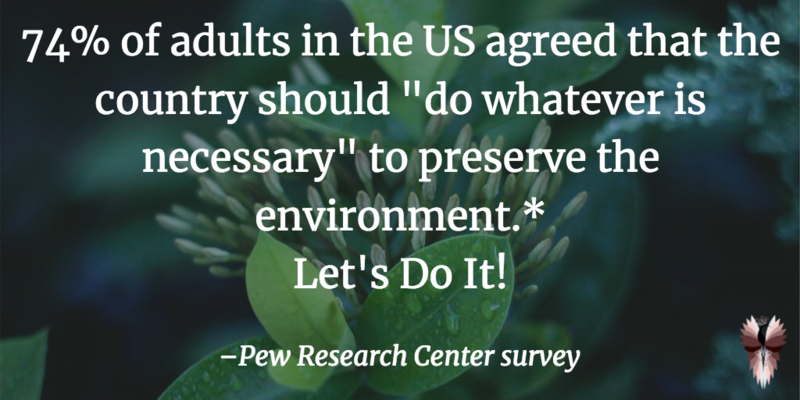 According to a January 2017 Pew Research Center Survey, 74% of adults in the United States agreed that the country should “do whatever is necessary” to preserve the environment. (2) Studies in Europe and East Asia found similar results, and governments in those countries have reflected this investment by implementing massive regulations restricting business with companies that excessively pollute. Even without such drastic legislation, brands that market their sustainable actions have a tremendous PR advantage over less green conscious competitors, in almost any market. Considering your business’s environmental impact in context of the global market is incredibly important. Even though the importance of sustainability may not be reflected in the current political administration, it remains a massive global priority. Last year, China pledged billions of dollars to develop clean energy sources and has levied strict penalties on polluters. The European Commission has created many laws within the European Union that support corporate social responsibility and sustainable development. (3) Any company with aspirations of tapping new global markets will need to begin implementing sustainability now. Companies in the US can embrace the “new model” of sustainability to scale, connect with their local communities, and engage their customers. It is possible. Drop me a line for a free 30 minute consultation and together we can talk about how your business can implement soft benefits into its practices. Data Paralysis and Over-Ambition: Are They Robbing Your Sustainability Team’s Momentum?